Step in and you’ll feel as if you’ve left the present day. Stroll along to see the various buildings of this restored, colonial village. Enjoy learning about the lives of the colonists who called Spanish St. Augustine their home. Take a tour through the Government House Museum, where Spanish governors once administered the colony of La Florida and current exhibits showcase the city’s amazing past. Watch professional costumed historians relive the life of Spanish soldiers and their families. Blacksmiths, carpenters, candle-makers and other tradesmen demonstrate how the settlers lived during the 1740s. A truly remarkable site, adults and children are enthralled with their visit to the Colonial Quarter. There is much to do and see in and around this historic area. The Old City Gates are a striking site toward the north end of St. George Street. They were at one time the only entrance into St. Augustine. The two ancient columns made of stone were built in 1808 as a line of defense for the city. Visiting the Oldest City in the United States would not be complete without taking a moment to see the Old City Gates. They are a symbol of the turbulent times faced by the original American colonists and a truly memorable landmark. After, walk through to enter St. George Street, a historic pedestrian mall where galleries, restaurants, shops and popular St. Augustine attractions greet travelers from all walks of life. Made completely by hand, the Oldest Wooden Schoolhouse is an architectural and historical icon in St. Augustine. Red cedar and cypress along with wooden pegs date this antiquated building and enhance its charm and importance in our nation’s past. Dating back to the early 18th century, a visit to the Oldest Wooden Schoolhouse is an inspiring experience. Originally the building had no electricity, no running water, no kitchen or bathroom. The kitchen was purposely put in a separate building to avoid the dangers of fire. Browse through the one-room schoolhouse and see the schoolmaster and students, and listen as they tell the story of what they did each day. See copies of original books that the boys and girls used and other artifacts. Take a walk through the kitchen and see the garden. The old pecan tree has been there for 250 years – a magnificent site. For people of all ages, the Oldest Wooden Schoolhouse provides a wonderful way to look back at the lives of our American ancestors. Shop if you wish or just take your time to gaze at all the unique items for sale in this 11-block stretch of shops, restaurants and historic sites. No need to worry about traffic because there is none since this area is a designated walking mall. On old St. George Street, in the heart of historic St. Augustine, charming shops, museums, historic buildings and beautiful views are on every corner. Many other intriguing points of interest are just a few blocks down the road. It is here that visitors from all around the world come to dine and shop and get acquainted with our nation’s oldest city. Walk in amazement and wonder as you see more than 800 exhibits at Ripley’s Believe it or Not Museum. Everything from the weird and unusual to the exotic is on display and ready to excite and entertain people of all ages. The museum is the original Ripley’s Believe it or Not, opening in 1950 just a few months after Robert Ripley’s death. Here, people can explore and interact, witness incredible illusions and see for themselves what Ripley collected from his travels around the world—many too outlandish to believe. Is it real or not? You be the judge at this fun-filled and amusing adventure. An incredible adventure for kids and adults of all ages, the Pirate & Treasure Museum offers visitors a chance to journey back 300 years to the era of the Golden Age of Piracy. This unique museum showcases one of the largest collections of rare pirate artifacts in the world including Captain Thomas Tew’s 17th Century Treasure Chest and the Journal of Captain Kidd’s Final Voyage in 1699. You’ll tour through interactive exhibits, high-tech, multi-sensory experiences and spectacular treasure and learn the fascinating history of swashbuckling pirates that lived on the very shores of St. Augustine and other ports along Florida’s coast. Built in 1739, the Old Drug Store is located at 31 Orange Street. It was here that tobacco, liquor, medicine, Indian remedies and handmade medical concoctions were sold. Stop in for a look at what life was like before computers and technology. This wonderful museum is a timeless treasure in the Old City, capturing the simplicity of the early days when St. Augustine was a Spanish settlement. Stop in for a visit and see the antique cash registers, bottles of remedies, elixirs and tonics and other items that are nostalgic of an era gone by. For a spooky good time, hop on the Trolley of the Doomed and visit some of St. Augustine’s most haunted spots. The Ghosts & Gravestones Tour has been frightening guests for many years – guided by their very own costumed conductors who will lead you on a terrifyingly entertaining tour of where the dearly departed still linger. The tour stops at the Old Jail, Potter’s Wax Museum and more. You’ll learn the scary secrets of the Ancient City’s dark past and have a close encounter with some of the city’s most infamous spirits. The Ghost tours run 7 nights a week and depart from the Welcome Center at 27 San Marco Avenue. 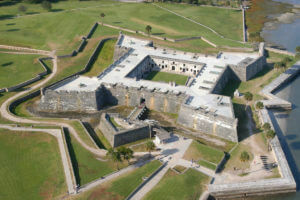 The oldest masonry fort in the continental United States, the Castillo de San Marcos sits on the shore of Matanzas Bay and was constructed in 1672 to guard the coast of St. Augustine against foreign invasion. Today, you can take a self-guided tour of the historic National Monument and learn about its fascinating history and significance to American history. There are a variety of exhibits to view, daily Ranger Talks, a short video shown every hour that features cannon and musket firings and weapons demonstrations and presentations by costumed re-enactors. This well-known attraction is the first wax museum to ever open its doors in the United States. Stop in to get a close look at the more than 160 wax figures on display. Sculptures are likenesses of famous politicians, entertainers, historical personalities, sports starts and other celebrities. Get your picture taken with King Henry VIII, Michael Jordan, Tiger Woods and much more.